Browse Through Our Inbound Marketing Resources! Here is where you will find Simple Marketing Now's Inbound Marketing Tip Sheets, Guides and Articles all available for download. Simple Marketing Now's tip sheets, guides and articles get to the essence of what you need to know about a specific online marketing topic so you can get started. In this case - Inbound Marketing. 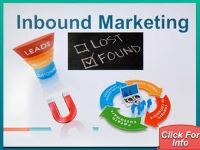 Three Principles of Inbound Marketing is a quick reference to help make sense of Inbound Marketing. Download Successful Inbound Marketing Checklists. A complete website redesignl using the principles of inbound marketing. Simple Marketing Now's 'Get Started' Guides start with the tip sheets and go into considerable more detail with tips, best practices and examples. The Inbound Marketing Guide is detailed below. Click on the link, and scroll down to browse through Inbound Marketing articles included in our Resource Library. with 22 pages of details, guidance and best practices. >> Click on Download Simple Marketing Now's Inbound Marketing 101 Guide to learn more and download your copy. Simple Marketing Now's How to Create an Effective Inbound Marketing Campaign Guide outlines the thought-process for creating an effective inbound marketing campaign as well as the mechanics in 24 pages. >> Click on Download Simple Marketing Now's How to Create an Effective Inbound Marketing Campaign Guide to learn more and download your copy. ZMOT and Inbound Marketing: Perfect Together?